Home - V. Alexander & Co., Inc. The Power is in our people. That means an experienced account team coupled with an unparalleled chain of accountability, and what you get is a partner who instills confidence for you to focus on your core business. V. Alexander has built a global business through efficient technology use. With complete transparency in showing each transaction and all information in real-time, we take accountability to the highest levels. Our highly trained staff and exception management systems have the knowledge it takes to help maintain compliance, mitigate risks, and keep your supply chain secure and moving forward. Our dedicated account teams have the experience to select Best-in-Class services to fulfill your business needs. This balance of people, technology, and compliance allows us to consistently deliver efficient results. Central to our success is a personal account team that is assigned to every V. Alexander customer. We then utilize customized technology to efficiently manage and monitor every transaction within your supply chain. With flawlessly accurate documentation and transparent compliance built into every process, V. Alexander & Co., Inc. effectively removes the problems from international global logistics. Ease, efficiency, and excellence, one transaction at a time. While all of our customers enjoy a level of service that far exceeds the standard, V. Alexander also offers an ever-growing suite of professional services that provide additional opportunities for our customers to benefit from our resources and experience. Let us help you take your supply chain to the next level. The amount of fees, duties, and taxes collected every day by U.S. Customs. Our team of licensed Customs Brokers, Customs Specialists, and a professional, experienced staff has the knowledge to navigate the complexities of U.S. Customs. The estimated number of containers that are currently traveling across the oceans. With steady increases in global container volumes, visibility of your freight is more important than ever! With our VISION software, we provide real-time global visibility and complete control over your supply chain. The maximum payload for a Boeing 747 Freighter. Our air freight services cover your expedited logistical needs to get your cargo where it needs to be, fast and on time. Percentage of global markets that outsource logistics functions. Vision is V. Alexander's online customer and partner portal. 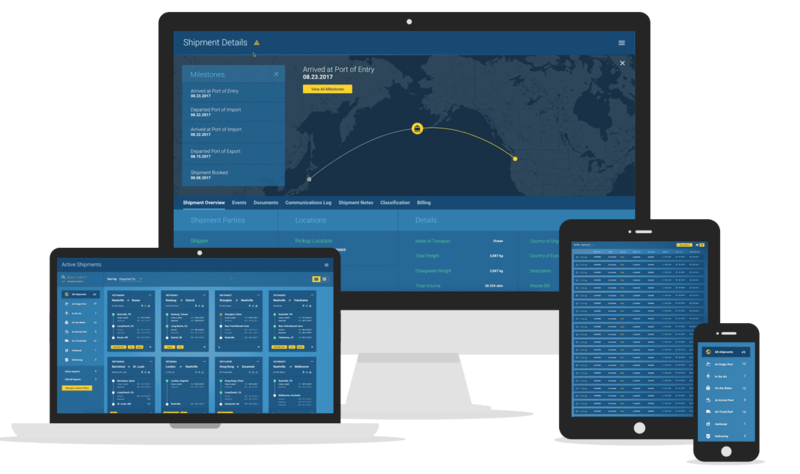 Far more than a simple tracking report, Vision is a full-featured global desktop that gives you complete visibility of your supply chain as well as streamlined communications with your dedicated V. Alexander account team. Whatever questions you have, Vision has the answer.